Einstein's theory of special relativity sets of the speed of light, 186,000 miles per second (300 million meters per second). But some scientists are exploring the possibility that this cosmic speed limit changes. Now and then, Einstein deserves to be tested. 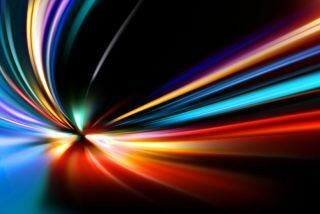 To that end, scientists have put his special theory of relativity — particularly its notion of the speed of light as the cosmic speed limit — to the test. Physicists measured the energy required to change the speed of electrons as they hopped from one orbital to another inside atoms of dysprosium, all while Earth rotated over a 12-hour period. This allowed the scientists to measure that the maximum speed of an electron, which, according to special relativity should be the speed of light, is the same in all directions to within 17 nanometers per second. This measurement was 10 times more precise than previous tests of electrons' maximum speed. Follow Clara Moskowitz on Twitter and Google+. Follow us @Spacedotcom, Facebook and Google+.